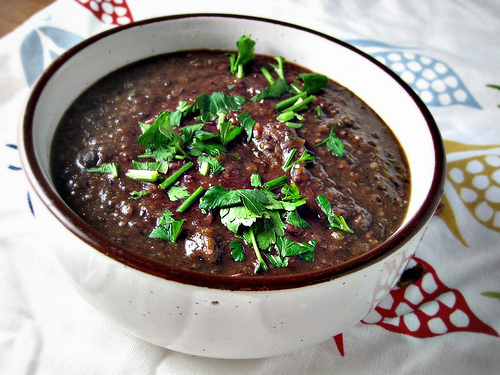 This very simple version of feijoada (a black bean stew) is for all the vegetarians who want to enjoy a taste of this very hearty and satisfying dish which also happens to the national dish of Brazil (the non-vegetarian version). Rani doesn’t tend to cook based off recipes, so this is an approximate account of how she makes her meatless feijoada. Enjoy! 1) soak dried beans overnight with at least about 1 1/2 – 2 inches of water covering the beans. Overnight the beans will expand and absorb much of the water. 2) Heat a large pressure cooker pot on medium-high heat and add olive oil. 3) add garlic and onion and brown for about 3-5 minutes. 4) add the beans to the to the pot and discard the soaking water. Stir in the beans to mix with onions and garlic. 5) add bay leaves and any salt, pepper desired. 6) add water to cover ingredients completely, and bring to a boil. 7) add potatoes, cover and secure with pressure cooker lid, and reduce heat. *8) cook for about 30 minutes. Once finished beans should be soft (you can check by how easy it is to mash one with a spoon) and potatoes should be cooked through. The consistency should be more creamy than watery. 9) Salt and pepper to taste and garnish with cilantro before serving. *Other options are to cook in a crock pot overnight or cook over the stove in a regular stew pot for 6-8 hours over very low heat. Join Our Mailing List For Info On Performances & Rehearsals! Show your Bata-love and donate! No photos, graphics, videos, or content in general of this website may be reproduced without Batala Washington's express consent. Handcrafted with by District Creative Studio | Powered by Genesis Framework.